Playskool is a toy brand owned American toy company Hasbro. One of the largest toy makers in the world, Hasbro is a global company committed to creating the world’s best play experiences by leveraging its beloved brands. From toys and games to television programming, motion pictures, digital gaming and a comprehensive lifestyle licensing program, Hasbro fulfills the fundamental need for play and connection for children and families around the world. Playskool wanted to advertise their new Lil’ Rocker Guitar via online marketing, targeting parents and families of children who were interested in music, rock and guitar culture from a child and toy prospective. The campaign needed to have a rock n’ roll feel while staying within the overall style and branding of the Playskool line. 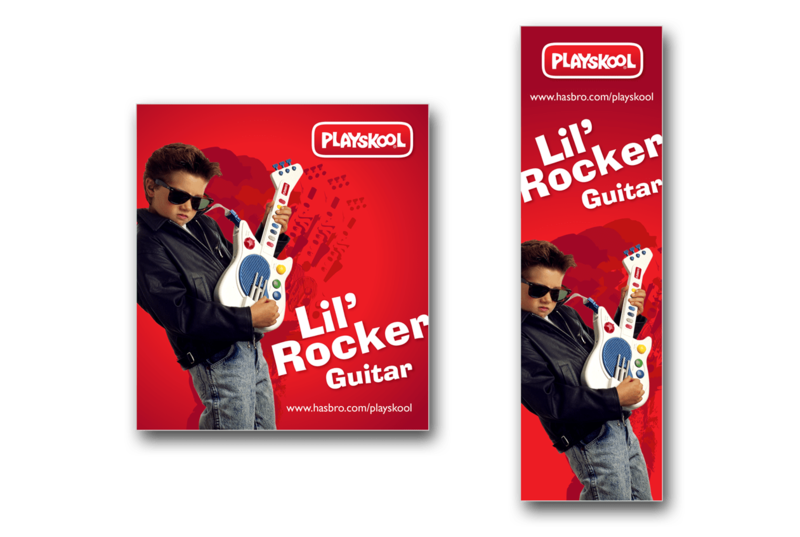 I worked with Hasbro to design and produce web banners which introduced the Lil’ Rocker Guitar on associated web placements. I also arranged a photoshoot, including styling and model casting, to provide specifically targeted photography which was uniquely aligned with the specific campaign. I created illustrations coinciding with the main product photo to create a harder rock feel without stepping out of the overall Playskool brand style guidelines.